Cook half the shallots in butter, add the rice and cook for 2 minutes, no color. Add the wine and reduce stirring occasionally. Add hot chicken stock just to cover and cook for another 20 minutes stirring and adding stock when needed. Add the cream to the shellfish stock and reduce by 1/4. Cook the sea bass on the skin side first in a nonstick pan until the skin gets crispy and then finish in the oven for 4-5 minutes. Sauté the mushrooms in butter with the remaining shallots, garlic and season with salt and pepper. Finish risotto by adding 2 ounces butter off the heat and stirring vigorously, then add the parmesan cheese. Add the mushrooms and chopped parsley to the risotto and place in serving bowls. 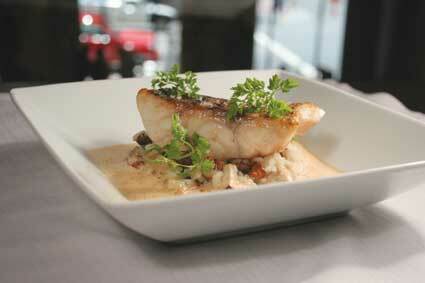 Place the sea bass on top and foam (use hand or immersion blender) the shellfish sauce and drizzle around carefully. Garnish the fish with picked chopped parsley.